Located on the 5th floor of the cultural center, this venue is our most popular. This space shines between 130-250 guests for a seated dinner but is flexible enough to accommodate 450 guests for a cocktail party and everything in between. 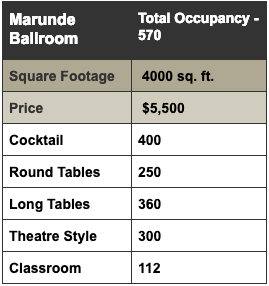 The Marunde Ballroom boasts all the necessary amenities: Full stage and dance floor, large main bar plus service bar, caterer's kitchen and cloak room. Ideal for all formal events with terrazzo floors, gilded plaster moldings, ornate, original light fixtures and historic chandeliers against dark walnut and creamy walls. Wedding receptions, quinceañeras, ceremonies and holiday parties are among the many possibilities. Contact us today to set up a showing! Appointments are available Monday-Friday 9:00am-5:00pm, Saturdays by appointment only or email us at rentals@dankhaus.com to coordinate additional times. ©2017 DANK Haus. All rights reserved.